LAWRENCE — As perhaps the most influential written work of all time, replete with drama, the Bible has been an irresistible source of material for the Broadway stage. University of Kansas Department of Theatre Professor Henry Bial’s latest book, “Playing God: The Bible on the Broadway Stage” (University of Michigan Press, 2015), surveys the 100-plus shows that have been based on the Good Book, assessing why some flopped while others packed them in, becoming standards and influencing the state of the art. While Bial calls “Jesus Christ Superstar,” “Godspell” and “Joseph and the Amazing Technicolor Dreamcoat” the “the big three” of biblical Broadway, he traces the phenomenon back to the “biblical fan fiction” of “Ben-Hur” in 1899. Staging that melodramatic spectacle, including the famous chariot-race scene with live horses, required technical innovation, while representing Jesus as a beam of light and not an actor overcame potential theological objections from the public even as it advanced stagecraft. Biblical adaptations continued at a pace of about one a year ever since. Bial undertook research on the phenomenon with the help of graduate students, poring over industry journals and newspaper reviews to arrive at a definitive list. The book covers some productions that are largely forgotten today but were influential in their time. Archibald MacLeish’s “J.B.,” a 1958 adaptation of Job, and Clifford Odets’ 1954 “The Flowering Peach,” the tale of Noah and the Ark, are two such plays. Sacred texts continue to provide fodder for the stage, and Bial considers the recent hit show “The Book of Mormon” in “Playing God,” even though it’s not based on the Bible. Nor, despite its many adaptations, does Bial think the Bible is played out as source material. “I suppose there is a Book of Ruth musical out there,” he said. 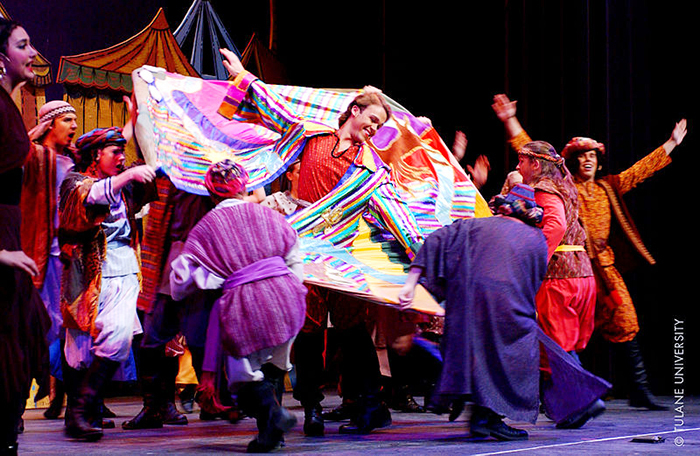 Photos, from top: "Joseph and the Amazing Technicolor Dreamcoat," via Tulane University, Wikicommons. At right, Henry Bial, via KU Marketing Communications. 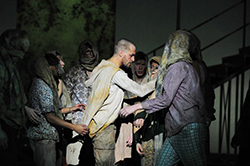 Bottom right, "Jesus Christ Superstar," Theater Basel, by Sandra Thon, Wikicommons.